I woke up Saturday morning with itchy feet. I wanted to get out and do something, something outside, in the sun with life around and about. But I was supposed to sit in front of my computer and edit stories. My computer screen stared back at me, and I thought of the places I could go, when my phone rang, it was Normal, and she wondered if I wanted to got and see poppies. Of course I wanted to go and see poppies. Yes, her name is Normal, it’s not her christened name, but it’s the only one we have ever called her. She is definetly not normal. So Normal and David -her boyfriend- stopped by and we headed north on the 5 freeway, out of Los Angeles. The plan was to meet up with a group called the Midnight Riders at Quail Lake, near where Route 138 met the 5 freeway. But we were late, and seeing no cars in the parking lot of the lake kept on driving. The Midnight Riders -a group of bicyclists from Los Angeles- had a plan, and a map to follow to eventually wind up at the poppies, with stops along the way. Normal had printed up a copy of the map, so we tried to follow it. I sat in the back, reading the map, badly. It seemed to me that the first stop was something called the Polaroid house, but we didn’t see it, so we kept driving. So the map said to take a left on 300th St, drive three miles, then another left and drive one mile. There was no turn at three miles, and we were out in the middle of nowhere in the high desert of California with just a dirt road leading off to the mountains. 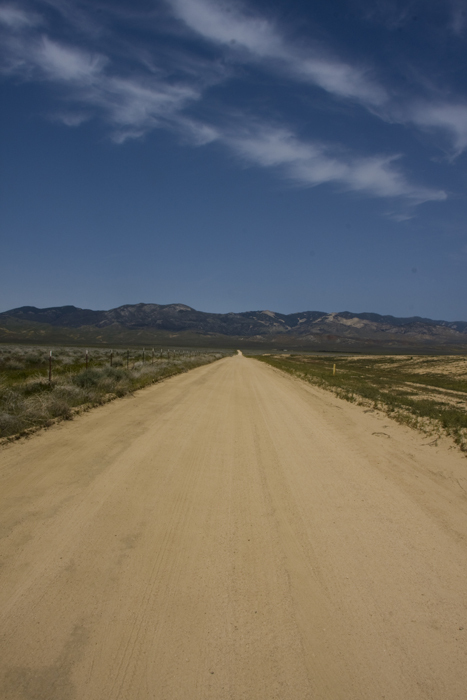 The straight dirt road of 300th St, heading north into the mountains, somewhere west of Lancaster. But we did come across a field of cherry trees in bloom. A perfectly rectangular stain of pink on the infinite brown of the desert. So we stopped. As we rolled to a halt, I realized that the third little blue dot we were supposed to visit were some cherry trees. 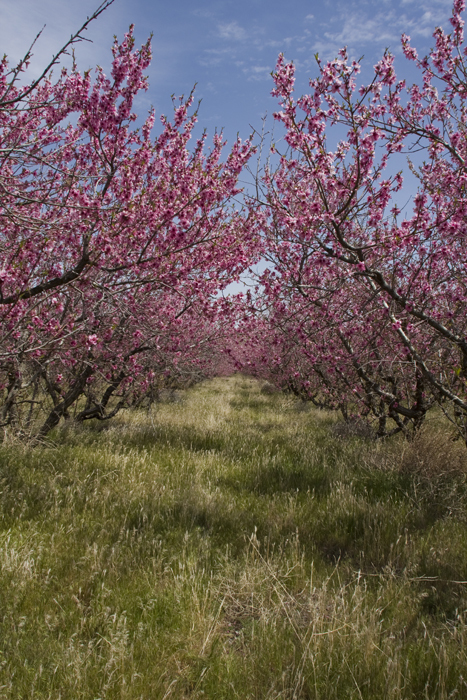 Cherry blossoms, in what looks like an abandoned field, west of the town of Lancaster. So we walked among the cherry blossoms. And realized, rather sarcastically, that we were better than everyone else, because we were walking among cherry blossoms. No? you don’t find that funny? 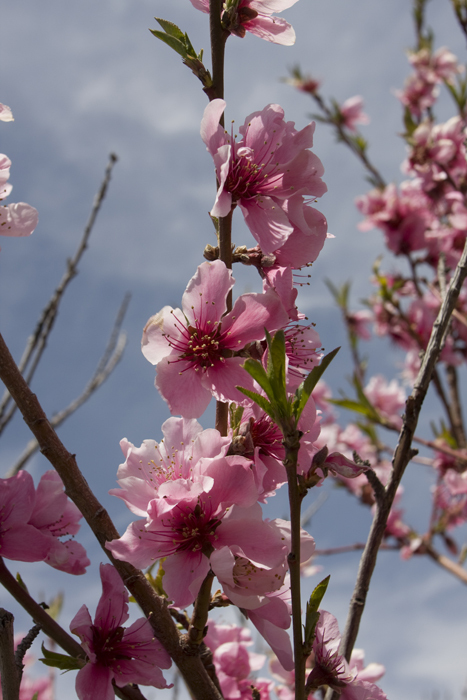 One branch of cherry blossoms, with the blooms just beginning to fade in their flowering life cycle, just west of the town of Lancaster. Just south of the cherry blossoms is the California Aqueduct running under 300th St. We had to stop and take a look at this perfect line of blue running through the brown of the desert. 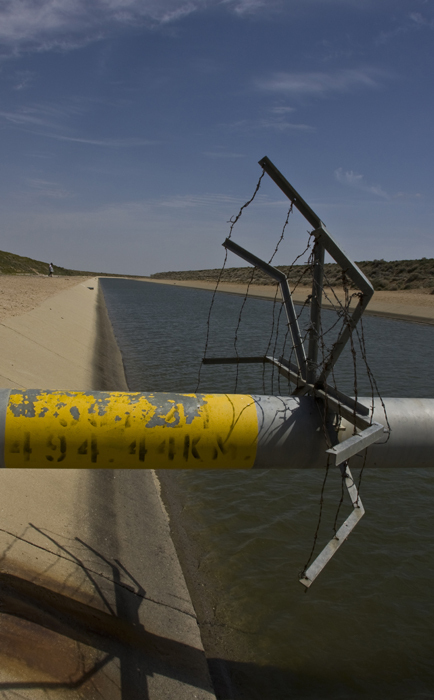 The California Aqueduct running underneath 300th St, with a set of barbed wire to stop people walking across the pipe that crosses over the water. I didn’t know there were fish in the aqueduct, and I didn’t know there was fishing allowed in the aqueduct. 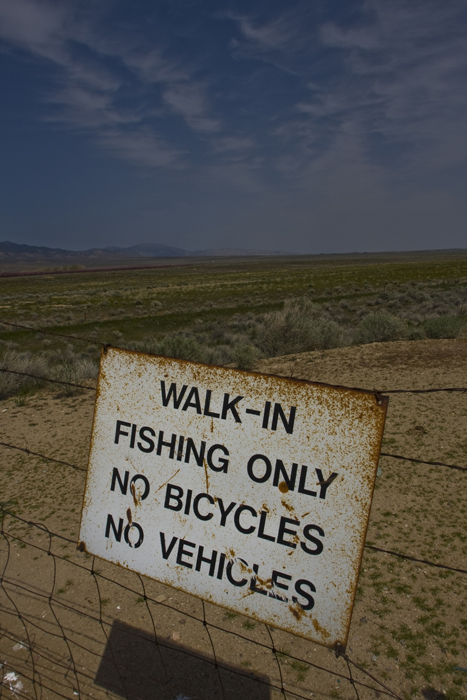 But I love the idea of a sign for fishing, with nothing but brown desert in the background. 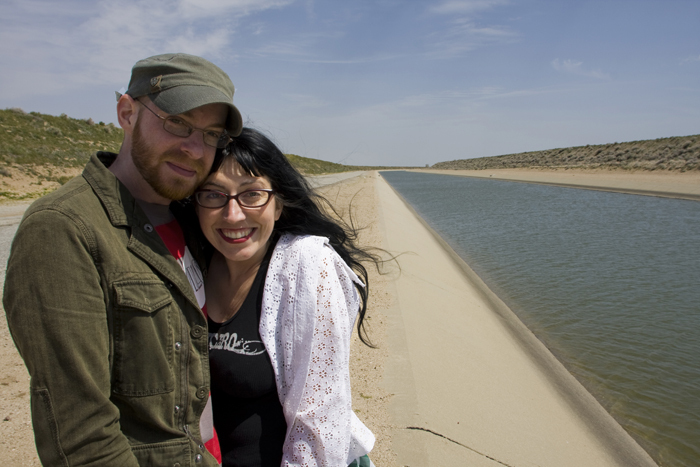 David and Normal next to the California Aqueduct. 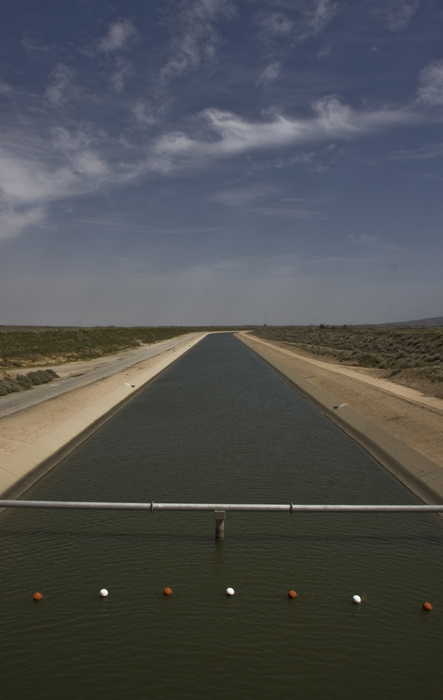 Standing on the bridge of 300th St, with the California Aqueduct softly flowing to the east, near the town of Lancaster. What is the address of where the cherry blossoms are? A lot of people have taken pictures there, but I don’t know where exactly in Lancaster it is. It looks amazing! Thank you. Head west out of Lancaster on Route 138, also called Avenue D.
Make a right on 300th St. The poppies are on your right after the California Aqueduct.